The goal of this project is to develop new simulation algorithms and tools for paint and surface treatment processes in automotive paint shops. The project is part of Vinnova’s FFI program for Sustainable Production Technology that supports the Swedish automotive industry and our research partners are Volvo Cars, Scania CV, AB Volvo, General Motors and Swerea IVF. In spray painting paint primer, color layers and clear coating are commonly applied through the Electrostatic Rotary Bell Sprayer (ERBS) technique. Paint is injected at the center of a rotating bell; the paint forms a film on the bottom side of the bell and is atomized at the edge. The droplets are charged electrostatically and driven towards the target car body both by shaping air surrounding the rotating bell and by a potential difference in the order of 50-100 kV between paint applicator and target. 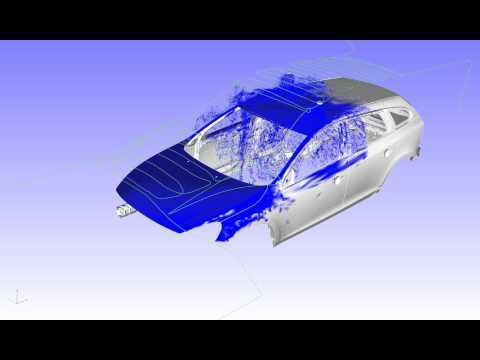 The aim of our work is to develop a new framework that can be used for accurate simulations of a complex car part in just a few hours on a standard computer. This is an extreme improvement compared to earlier approaches that require weeks of simulation time. Unique algorithms for two-way coupled simulations of air flows, electrostatic fields and charged paint droplets have made this possible. Particularly important for the computational efficiency is the in-house Navier- Stokes solver – IBOFlow (Immersed Boundary Octree Flow solver). Novel immersed boundary methods are used to model the presence of objects in the fluid and they are combined with an adaptive Cartesian octree grid. This enables modeling of moving objects at virtually no additional computational cost, and greatly simplifies preprocessing by avoiding the cumbersome generation of a body conforming mesh. The paint simulation algorithms have been integrated in a virtual paint module in the in-house package for automatic path planning, IPS. In the software, an arbitrary geometry can be painted using one or multiple robots. The user sets the process conditions like paint flow, air flow, electrostatic droplet charge and atomizer bell rotation speed. To validate IPS Virtual Paint – Spray several measurement campaigns have been performed. At Fraunhofer IPA in Stuttgart a Volvo V60 car fender was painted with different process conditions and the resulting predicted paint thickness was compared to measurements showing a very good agreement. The resulting paint thickness along three lines of the car fender is compared to measurements. The software IPS Virtual Paint – Spray is commercially available since 2014 and distributed by IPS IBOFlow AB. Our industrial partners predict that positive effects will include a reduced time required for introduction of new car models, a reduced environmental impact and an increased product quality.